the Makerie: it's here ~ creative pilgrimage! it's here ~ creative pilgrimage! 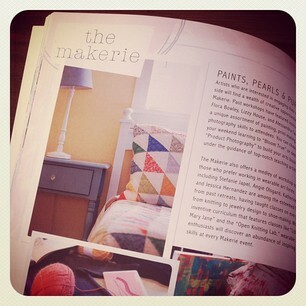 We shared a few months ago that we were featured in a book (yes, a real book called Creative Pilgrimage!). Well it just arrived in the mail and to see it actually in print was quite a fantastic feeling. Never in a million years did I think our new little event would be part of a book, let alone a totally gorgeous one! To be in the same publication alongside amazing retreats across the county and incredibly inspiring artists and their projects has left me over the moon with excitement and quite frankly, disbelief! What really says it best is the most lovely dedication by author Jenny Doh. I've shared it below. "I dedicate this book to the courageous spirit of discovery within us all ~ the spirit that helps us put aside our insecurities and imperfections as we take a leap of faith in our quest to learn, to teach, to grow. May this book remind us that the time will never be perfect, but the time will always be now, to embark on pilgrimages both big and small." With enormous gratitude to Jenny for believing in the Makerie enough to include us in Creative Pilgrimage. It's certainly a dream come true.